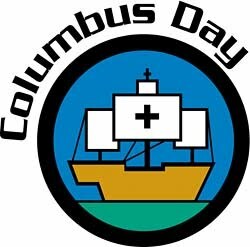 On Monday children have off from school for Columbus Day. Here are some books to borrow from the library (or purchase) about Christopher Columbus. Where Do You Think You’re Going Christopher Columbus? By Jean FritzChristopher Columbus counted on finding gold and spices when he set sail to discover a new route to the Indies, but all he got was parrots, naked natives in grass huts, and mosquito bites. But that didn’t stop him from making more trips across the sea. What he never expected was that he’d discover a whole new world. Jean Fritz makes history accessible once more in this wry biography of a legendary explorer. An ALA Notable Book, A School Library Journal Best Book of the Year, A Booklist Notable Children’s Book of the Year, and an American Bookseller Pick of the Lists. For Secondary school students this is a wonderful book available from Scholastic called “Pedro’s Journal.” It is the story of a young boy who is sent to sea with Christopher Columbus because the boy knows how to read and write. Pedro records his experiences in his own journal. This book is his account of what happens on that journey. Click here for more books about Columbus Day. Don’t forget to stop by next Saturday for another Weekly Trip to the Library.